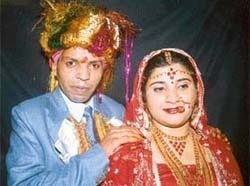 A 22-year-old local girl and mother of a 4-month-old son is suspected to have been poisoned to death by her husband and in-laws this month in Shimla for the failure of her father to meet a Rs 50,000 dowry demand. Politics makes strange bedfellows; this is all the more true for the city leadership. Those who had opposed the implementation of property tax are now claiming this to be one of their major achievements. The managements of various clubs and CITCO-run hotels — Mountview and Shivalikview — in the city cancelled all special celebrations scheduled for the New Year eve tomorrow. 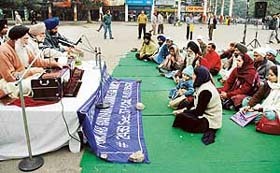 The voluntary health association of Punjab organised a meeting to mourn deaths of tsunami victims at Sector 17, Chandigarh on Thursday. The Tamilians of Chandigarh have never prayed harder. Helpless for the moment and scarred for a lifetime, they can perhaps do little than pray, at least so long as they are away from their home state where thousands of their brethren were devoured by the killer Tsunami. Officers and staff members of the Regional Labour Commissioner (Central), Chandigarh, and its subordinate offices in Shimla, Karnal, Faridabad, Jammu and Jalandhar have mourned the loss of human lives due to tsunami waves in the South and other neighbouring countries. 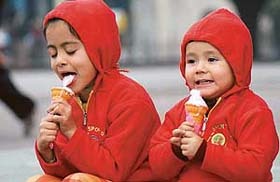 Two children, to ‘beat’ December chill, savour ice cream in Sector 17, Chandigarh, on Thursday. 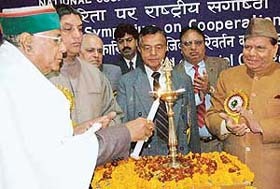 The Chandigarh Administration has constituted a coordination committee for the periodic review, imparting of technical training, maintenance of buildings, upkeep of lawns and for providing healthcare facilities to inmates of those social welfare institutions which are being run with government assistance and are housed in government buildings. Surkhab Shaukin has come a full circle. 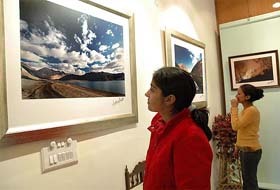 Starting off as a budding photographer some years ago, the 23-something artist today paid a befitting tribute to the city of his belonging by dedicating the permanent gallery of his works to it. Visitors take a round of the Surkhab Shaukin Photo Gallery which was inaugurated by Capt Amarinder Singh in Sector 11, Chandigarh, on Thursday. The year gone by can be described as the year of change. The year 2004 saw many unprecedented changes in the short history of “City Beautiful”. From every aspect, may it be social, administrative or political, there were many changes. 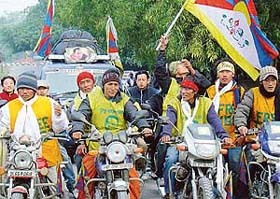 Out on a World Peace Mission, a dozen odd Tibetan students arrived in the city today, riding motorcycles and spreading the message of love and harmony. Moving in the form of a rally, these students started their journey a month ago from New Delhi. Women victims of crime need not hesitate now while complaining to the police as there will be a woman police officer in every police station of UT to take care of their woes. The UT has 11 police stations. There can be no unity amongst the ex-servicemen as the rank structure after retirement was the main hurdle. Persons below Officer ranks are shabbily treated by the high-ranking retired officers even after retirement. 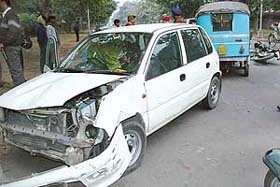 A car involved in an accident at the Sectors 27-28 dividing road in Chandigarh on Thursday. The society for social health organised a programme at Economically Weaker Section Colony, Sector 52, here to distribute woollen blankets among the poor, disabled, old and widows. Doordrashan Chandigarh will telecast a special musical programme on new year’s eve from 8.30 pm onwards. According to a press note issued by Mr Mahesh Chopra, assistant station director, DD Chandigarh will telecast the programme for all terrestrial viewers. Body of a six-month-old baby girl was found in Lalru village along the Kalka-Ambala Railway line this afternoon. A passersby noticed the body which was covered with woollen cloth on the railway line. He informed the Railway police personnel at Lalru police post. Ashok Kumar (53), a former employee of the Electricity Department, was found dead at his residence in the Power Colony in Sector 15 under mysterious circumstances, this afternoon. Two houses were reportedly burgled in the city during past 24 hours, the police said here today. Mr Nishad of Sector 22-C reported to the police that Rs 27,000, seven shawls, five saris and one leather jacket were stolen from his residence, yesterday. Candidates appearing this session in Class X examinations being conducted by the CBSE have demanded that the date sheet should be revised to allow gap between the English paper and the Punjabi paper. 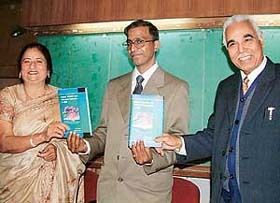 Dalip Kumar (centre), DPI Colleges, releases a book, "Federal Transfers and Inter-State Disparities in India", at ICSSR Auditorium, Panjab University, in Chandigarh on Thursday. In Sahara One Motion Pictures and Nitin Manmohan’s ‘Dil Maange More,’ Shahid Kapur’s heart beats for debutant Soha Ali Khan (Sharmila Tagore’s daughter), Ayesha Takia and Tulip Joshi. It is a Fourth Wall Productions film produced by first time producer Nikhil Panchamiya. It features stars of new generation. It will release today at Batra Chandigarh. “Dil Maange More’ is a romantic comedy of a boy and three beautiful girls directed by ‘Dil Vil Pyaar Vyar’ fame director Ananth Mahadeven. 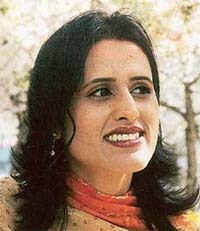 “Coming events cast their shadows before...” truly applies to the Mississauga (Toronto)-based Devyani Sharma, popularly known as “Sherry”, who had established her credentials of being a prodigy in the realm of music at an early age as a school and student at Kalka, her native place. New Year celebrations are all set to touch fresh heights. Having doubts? Ask the revellers. They will tell you all about it. Tish and her gang of three are all set to zip uphill with tsunami washing away the celebrations in the city. The Department of Ophthalmology, Government Medical College and Hospital, Sector 32, here will start a clinic on low vision aid from the coming new year. As many as 130 students of the Central Scientific Instruments Organisation Sector 30 here donated blood at a special camp organised today in collaboration with the State Bank of India. 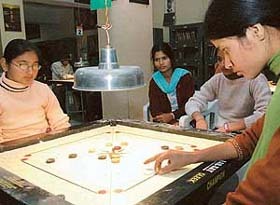 Sushila Prasad and Gagandeep Singh entered the last four of the women and men singles event, respectively, of the seventh Raj Kumar Babuta Memorial Prize Money Carrom Tournament, which entered the penultimate day here today at the St Stephen's School, Sector 45. The Chandigarh Golf Association will hold the Fifth UT State Golf championship on January 27 and 28 at Chandigarh Golf Club. The events will be held for boys above 18 years, below 18, below 13, below 22 and below 15 years for girls with various handicaps.